In this week’s episode of the Futility Closet podcast we’ll look at the strange phenomenon of poet doppelgängers — at least five notable poets have been seen by witnesses when their physical bodies were elsewhere. We’ll also share our readers’ research on Cervino, the Matterhorn-climbing pussycat, and puzzle over why a man traveling internationally would not be asked for his passport. John Oxenford, trans., The Autobiography of Wolfgang von Goethe, 1969. G. Wilson Knight, Byron and Shakespeare, 2002. Julian Marshall, The Life & Letters of Mary Wollstonecraft Shelley, 1889. Jon Stallworthy, Wilfred Owen, 2013. W.E. Woodward, The Gift of Life, 1947. 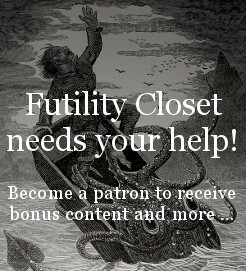 The stories are recounted in the corresponding posts on Futility Closet: Goethe, Byron, Shelley, Owen, Powys. Little House of Cats has a photo of Cervino, the (purported) Matterhorn-scaling kitty cat of 1950. The Daily Mail has photos of Millie, Utah mountaineer Craig Armstrong’s rock-climbing cat. More at Back Country. BBC News, “Secret Life of the Cat: What Do Our Feline Companions Get Up To?”, June 12, 2013 (accessed March 26, 2015). National Geographic, “Watch: How Far Do Your Cats Roam?”, Aug. 8, 2014 (accessed March 26, 2015). This week’s lateral thinking puzzles are from Kyle Hendrickson’s 1998 book Mental Fitness Puzzles. If you have any questions or comments you can reach us at podcast@futilitycloset.com. And you can finally follow us on Facebook and Twitter. Thanks for listening!